Heat gas or charcoal grill. In medium bowl, combine taco seasoning mix, oil, lime juice and honey; mix well. Brush mixture evenly over all sides of chicken quarters. When grill is heated, place chicken on gas grill over medium heat or on charcoal grill 4 to 6 inches from medium coals. Cook 30 to 40 minutes or until chicken is fork-tender and juices run clear, turning frequently. Meanwhile, combine all salsa ingredients; mix well. Serve salsa mixture with chicken. You can substitute bone-in chicken breasts for the quartered fryers if you like. Just be sure to cook the chicken until it is fork-tender and the juices run clear. 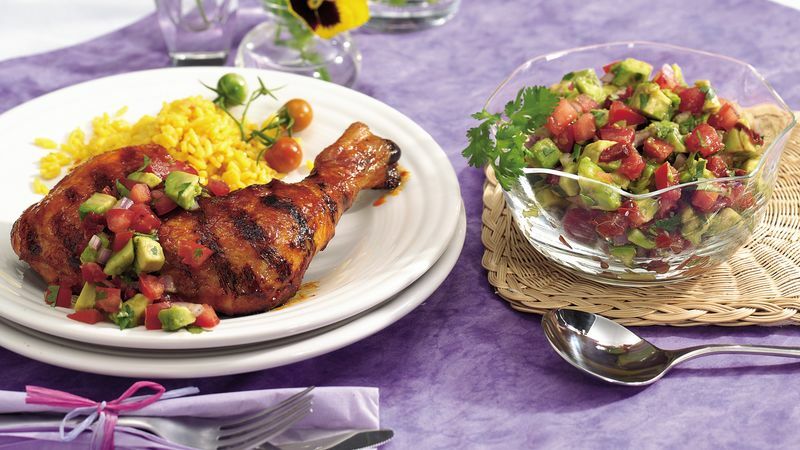 To broil chicken, place on broiler pan; broil 4 to 6 inches from heat using times above as a guide, turning frequently.